This article and betrep has been re-edited/re-written (from my other old site: Table Top Titans). I decided before I even created this new place that I would redo the thing (which was only ever written as a sample of how the game could be played) and one day carry on from where it originally left off. This I may well do over very soon. The interesting thing about this hobby is how we have this habit of being all excited over a range of figures, a new scale or game genre; then over time, we loose the spark that maintains the fire, and the once treasured pieces get shoved to one side (unloved and unused) in a box, while we move onto other currently more interesting things. But the intriguing thing is: very often, maybe even years later.... we end discovering a rekindled interest in `all things old` leading to a refreshed resurgence in these dusty and banished cast offs. This has indeed happened to me after a very long absence of interest and totally drained enthusiasm: I have, indeed, just rediscovered my love of 10mm fantasy, and in especial a little game I wrote many years ago called "Dungeon World". 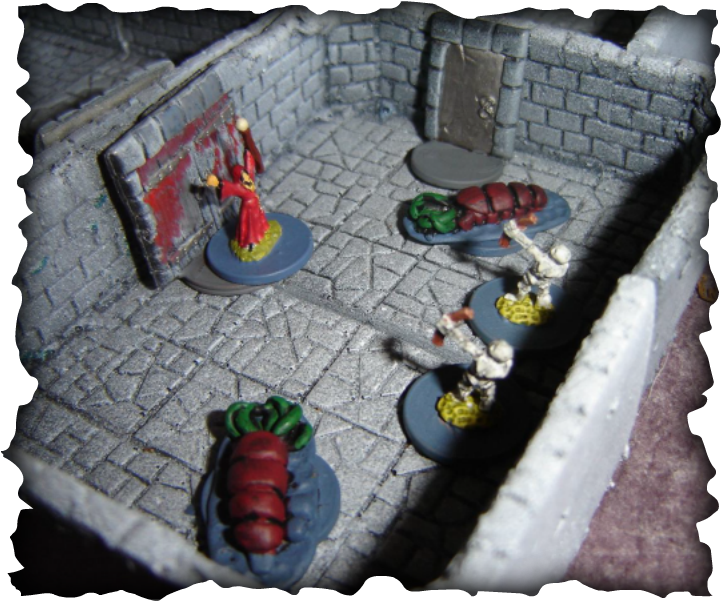 When I created a set of rules for 10mm Dungeon Crawl Gaming, I always had the Pendraken Miniatures range in mind. Yes, I do use the odd bits and pieces from other companies... what gamer doesn`t? But the large bulk of my collection (98%) is all from the same source. While I`m all for diversity, personally I do prefer the aesthetic symmetry created by collecting from one favoured company... fleshing out personality npc types, creating themed miniature cameos for special encounters, and so on. I only really purchase elsewhere when I need to fill a specific gap in my collection which is not covered by my preferred provider. 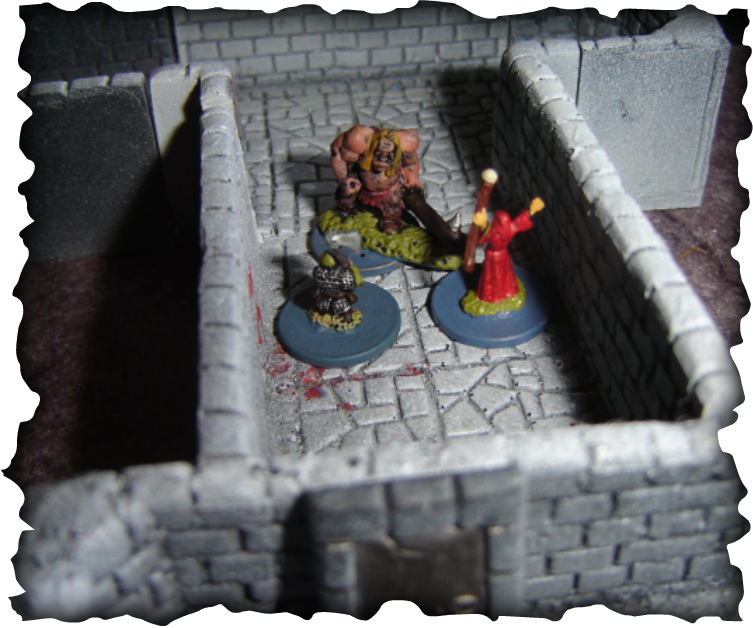 Pendraken has always remained my preferred choice for 10mm Fantasy, basically because thanks to Germy the guys there were offering a complete 10mm Resin Dungeon and a full range of Dungeons & Dragons style monsters to go with it. The choice to continue collecting Pendraken Miniatures was (for me) a natural progression from this. Later on, I expanding my fantasy collection to include Jacobites for Northern border incursions, English Civil War and Monmouth Rebellion... all to add a sense of `realism` to my quasi-medieval/renaissance world. ...okay, Monmouth is stretching that premise a bit, but hey... its all really just another extension of Imagi-Nation Lace Wars, right? Where I did find myself picking off figures from other companies was really only shown in my small collection of stalwart dungeon heroes. When I started building up Dungeon World, there weren`t that many choices for heroes (which was my mistake: because I didn`t know the available Pendraken range well enough at the time to pick and mix a few Ancients and Medieval personality types into the cauldron to create my necessary Warrior, Mage, Rogue, Elf, Dwarf, Halfling... bla bla, traditionally associated with RP gaming. So I turned to Copplestone Castings for those and bought a set of nine 10mm heroes from their Middle Earth range (the unofficial Fellowship). However, when Leon from Pendraken sent me a boxed starter dungeon set as a present for having written the rules and for my assistance in helping put the finished game together; I was delighted to discover inside, was a packet of beautifully sculpted heroes and personality types, which completely filled the gaps I had earlier been forced to expand my horizons to seek. Just a quick word on my modelling. I started playing long ago in the last century (Uugh! am I that old). The golden days of 1960`s and 70`s `old school` gaming where the likes of Donald Featherstone, Terrance Wise, and Gavin Lyall adorned their wargame books with (usually black and white) photographs of plastic Airfix miniatures – basically children`s toys newly promoted to the table for the new breed of `grown ups` to play with. These were basically kids` toys... no way to dress it up... this is exactly what they were! Long before the precision scale modelling of today, excellent though it is; the appeal of those glory days is for me, by association, still an important part of the whole spectacle. I play with toy soldiers and am proud of it. Like Peter Pan, a part of me never quite grew up. As a result, I still seek to make my collection look and feel old school in their assembled appearance. So please forgive me, and perhaps look with a less critical eye at my modelling efforts... it is deliberate. In the past, I`ve gone the Eavy Matal route; with show case pieces, dioramas and exquisite King’s Random one off`s, and yet I find myself repeatedly drawn back to the old, often shiny, stylised paint jobs of my youth. This now is out of personal choice, and not just bad painting (that`s my excuse and I`m sticking to it *wink*). The following scenario was put together to help those who are new to Dungeon World, to better understand the rules of the game. The concept, easy though it is, sometimes seems to elude new players because I don`t always follow standard accepted norms in rule writing. I`ve never been scared of breaking a few rules to create a few new ones of my own. Hopefully the following pages will show exactly how a game of Dungeon World plays out, and will encourage more experienced gamers alike to take a delve into this fascinating alternative to their other table top endeavours. So, with feverish hands you`ve probably thrown open your new Pendraken Starter Dungeon Set, gone oooo and aaaaa over the contents of your initial purchase… and you`ve no doubt found how incredibly quick and easy it is to paint your very own 10mm miniatures, you`ve pored over the rules, fallen madly in love with the game concept (I hope), and now you can`t wait to cut your teeth on an actual game. That`s how I was when I first discovered 10mm dungeon crawl wargaming. Only, when I started there were no rules available for playing this style of table top gaming – there still aren`t. I guess the scale is considered too tiny and fiddly by many. But the visual appeal and the small space needed to play a substantial game is an appealing consideration none the less, which is what prompted me to look into this scale in the first place. When I discovered there were no rules available for this genre of game, I invented my own. Thus, I have written the following scenario and battle report for you to get an idea of how everything works. The rules for Dungeon World have been fine tuned over a period of several years, by testing out this rule and that... discussing everything with my players, and listening to all the helpful advice they could add to make the game better. Mostly, the rules have been tweaked here and there due to using the system to play an actual long term campaign with my family and friends. The following cameo is part of a simple little campaign that I initially used to play test the rules with my family and friends (plus the help of a local games club). The following `session` will help give you an idea how an average adventure might be played out... I say `might be` because there are many various ways the game can be set up, depending on the individual groups of players (or even solo player); the following is just one example. This first quest is like the pilot episode of a new TV show. The characters are not yet fully fleshed out, and the plot can still leap in any direction at a moment’s notice. Players: My daughter Tiffany is playing all four heroes, while Hillary (my partner) is the Draken Master. This suits Hillary fine, as she loves being the dungeon master in role playing type games (Dungeon World uses the term Draken Master in honour of the Pendraken Miniatures being used). My job today is to sit and watch them both play, and to write the narrative. A small town nestled deep in a mountain valley has been attacked repeatedly by a rather nasty Troll called Narka. This oversized bully has a liking for human flesh, and tends to come out of his lurking place at infrequent times during the long cold winters to drag off any luckless innocents he can find. It just happens that the party of adventurers (i.e. the heroes) are sitting round a large inglenook fireplace, drinking and talking quietly among themselves in a dark corner of an inn (why do most role play adventures always seem to start in a drinking house)… when suddenly, an old man in a tattered robe approaches them and asks if he may sit down and join them in an ale. Everyone instinctively looks towards Sola, the spokeswoman and un-appointed leader of the group. The old man tells them about the troubles in the town, about the Troll; and how the community is caught in the clutches of fear, wondering when the creature might strike again. Narka hasn`t bothered the town for a few months and people are starting to get anxious again; "The Troll must be hungry, and I think he will soon come looking for his next meal – unless he is stopped first!" The old man fixes everyone with piercing eyes, and continues: "I see great potential in you all… here is a map. It leads to a section of an ancient underground complex ruled by the Troll. He is a dangerous foe, and none here in this town has the skill or courage to face him! But there is great wealth to be won in his domain, and… possibly his abode even contains some lost magical artefacts... devices... buried from a bygone age". At this last comment, the old man notices the sudden fire which burns deep in the heroes eyes. "Prove yourself by killing him and perhaps we’ll meet again". The old man thrusts a crumpled scroll towards the middle of the table, and without further ado he hobbles out of the front door and vanishes into the night. 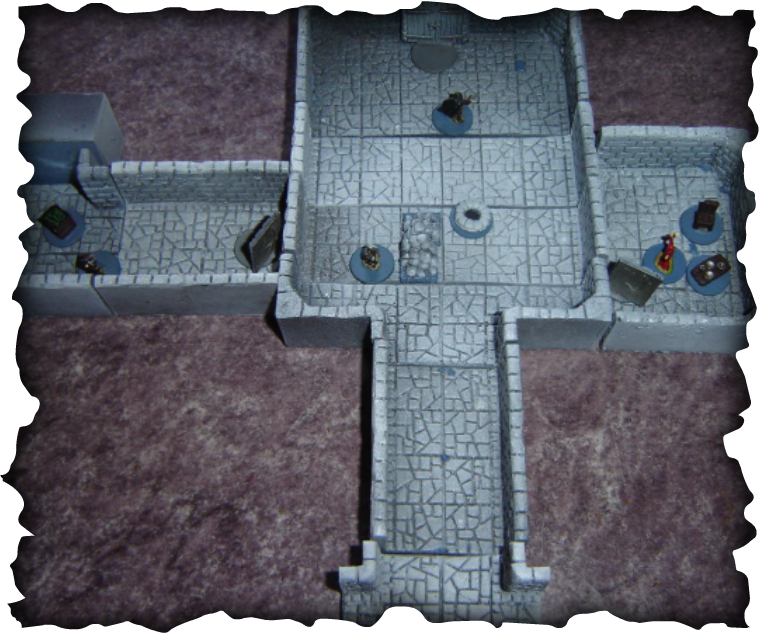 After journeying for several days and nights to the old dungeon complex shown on the map, the heroes prepare to descend into the depth. The goal is to kill Narka the Troll while collecting as much treasure as possible along the way. If the heroes can retrieve some of the ancient magical devices found within the dungeon, so much the better. The heroes start the game with 5 Victory Points. This means that the hero team can be killed off and re-spawned five times (as a group total) during the game before the Draken Master wins by default. wooden covering is rotted in places and the heroes can see that the well itself is full of mud and slime. A foul smelling mist rises from the well and clings to the floor, and the heroes can hear shuffling feet as several creatures approach from the shadows. The stench of Orcs assails the heroes nostrils. The heroes automatically win initiative for the first move. Springing forward from the entrance steps, the four intrepid adventurers take in the scene around them and quickly fan out, already preparing to take on head to head anything that approaches them from the shadows. 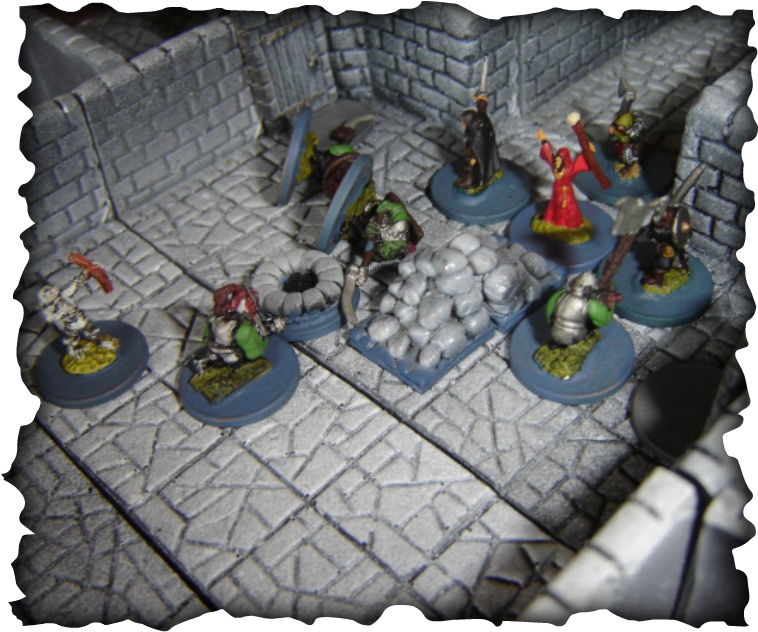 A few Orcs and an undead skeletal archer block their path! staff. Seven dice clatter onto the table, but despite having two Orcs clearly in her sights… for all her efforts she only scores a single wound on one of the monsters – at this stage in the game a single hit is easy to remember, so the wound is jotted down on a piece of paper, rather than a token placed underneath or beside the base of the injured monster. Sir Crispin and Red advance steadily and take up positions flanking their leader. The Dwarf Scout follows close on their heels. The four companions form a strong defensive line against any charge attacks the enemy might mount. A lone Skeleton Partol guard tries to find a bead on the intruders but its line of sight is blocked by a mound of fallen rocks, and an Orc`s muscular frame hinders the undead archer from aiming a shot at Crispin. The monsters win initiative for the move… beating the heroes score by one digit on their die, despite the Dwarf woman`s initiative bonus. With an angry snarl, the Orcs rush forward in enthused anticipation of the kill… their pack mentality already overwhelming their primitive minds with instincts of bloodlust and violence. – Orcs get a special ability called "pack" which means each Orc receives an extra attack (To Hit) die for each and every additional Orc within the same melee. One Orc runs round a corner to attack Sir Crispin. Another leaps over the well to join its companion. A third creature attacks Red round the far side of the rocks. Sola cannot find a legal target during the heroes Non-Mover`s Action Phase, and the game quickly advances to the Melee Phase. Neither Red nor the creature attacking him manage to inflict any hits on each another. But over on the other flank Sola and Sir Crispin slay both their Orc opponents. However, the vile monsters are using their special pack ability and end up placing four wounds on the heroes… two hits each. The Initiative stays with the monsters on the 3rd Move, and the remaining Orcs charge forward, eager to get to grips with the heroes. The lone skeleton archer takes aim and shoots at Sir Crispin – and misses. Once again Sola is engaged in combat and cannot use her flaming staff to shoot any magical missiles at her foes. 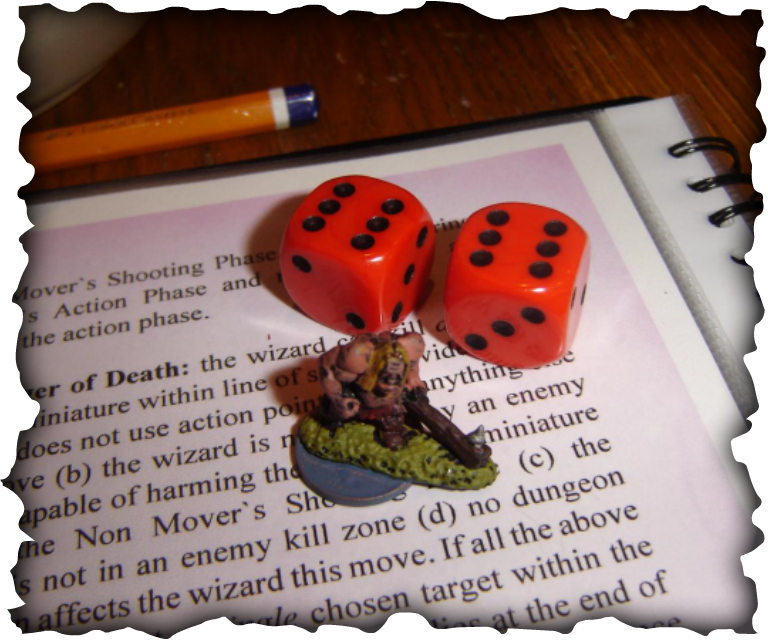 Instead, Sola and the Dwarf combine their strength and slay one of the Orcs in melee; yet despite the two Orcs throwing 6 dice with their own attack (2 each +1 a piece for attacking in a pack) they roll badly, and a single hit is all the damage they can dish out. Sola is singled out for another hit. The Heroes finally throw high and win Initiative. Their line of defence seems to be holding firm so far, and they try to press more deeply into the complex. 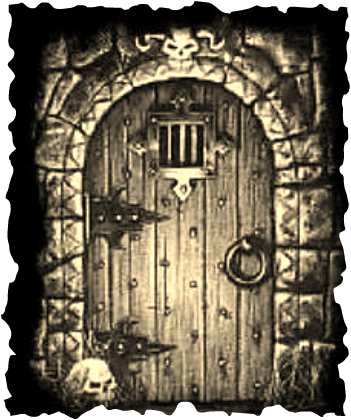 Sir Crispin moves forward slowly to cover Sola as she dashes for the large heavy looking wooden door on her left… could the portal lead to a chamber and treasure beyond? The Dwarf Scout, Wwth her wild berserker’s heart barely able to contain the impassioned anger she feels coursing through her blood, the faithful hero moves to aid Red who has been battling the last of the Orcs all on his own. The skeleton takes aim and shoots at Sir Crispin, but once again – it misses. The Dwarf chops at the Orc, inflicts a single hit. But the Orc has already taken a wound from a previous move, and the result turns into a kill. On its return swing the Orc cuts wide and misses the Dwarf by an arm’s length, and the foul smelling creature crashes gurgling to the floor, and moves no more. Author`s note: I notice that both Tiffany and Hillary seem to be using a simultaneous knock for knock routine in melee, and I ask them both why they have chosen to do this instead of playing it by the book? Hillary replies that Tiffany and herself had decided (before the game) to alter the normal rules for a slight change of pace (i.e. normally the mover hits and kills first, and then the non mover fights with what is left). I just nod and smile to myself – pleased the rules are versatile enough to be customized so easily and so spontaneously. On the following move (the 5th) the Initiative swings back in the Draken Master`s favour and the remaining Orc charges towards Sir Crispin, but not before the Skeleton bowman looses off another arrow - and misses again. For its pains, Sir Crispin dices the bold Orc into a number of small pieces. On Move 6, the Draken Master maintains Initiative and the Skeleton finally shoots - and hits. It scores a single 6 on the kill dice. Sir Crispin feels the dull ache of an arrow as it pierces deep into his side; a wound marker is now placed beside the figure`s base. Move 7, and the Draken Master wins the Initiative once again. The Skeleton shoots, but its lucky streak has come to an end almost as quickly as it started and the arrow clatters harmlessly off the wall. But on Moves 8 & 9 the heroes wrestle Initiative from the enemy two moves in a row. 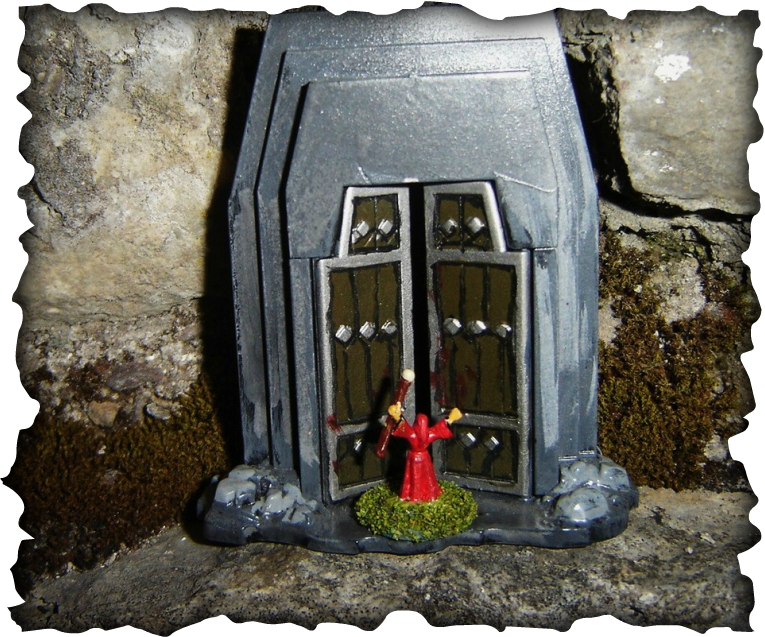 Sola opens the door ahead of her, and discovers a small chamber. The room is bare, except for a large table covered in bowls and dishes and fresh food of various descriptions. The Witch moves over to the table and explores the contents of the table. This little sortie into the side chamber has benefitted the whole party, and her exploration means each of her team members regain 1 hit point. She herself regains 2. (See Table of Food in the rules under Pick Ups). Meanwhile, Red opens the door on the right, moves down the tunnel a little way, explores a crate of apples (restoring 1 hit), then carries on moving and picks up a treasure pile (25 Gold) sitting in a dark corner. Sir Crispin quickly finishes off the lone skeletal guard, and suddenly the area is clear of any immediate danger. I casually observe that Tiffany`s heroes are doing quite well for themselves, and Hillary secretly tells me she has decided to stop being lenient on her (her first ever game) as she whoops and capers with joy and excitement. From here on in, Hillary is going to be checking for Random Monsters every move. Tiffany`s heroes have had it real easy up `til now; but that’s gonna change – rapidly! Evil grin. The First Area is finally cleared of all danger - for now. The Draken Master wins Initiative. She rolls for random spawning (wandering monsters) and throw 5, 6, and 6. WOoohahahha! She gets to spawn two dice full of critters. Checking on the Random Spawn Table, she throws two dice again and ends up spawning a two man Skeleton Patrol and a couple of Vicious Grubs– oooh lovely. extremely reluctantly, she is forced to disregard the remaining monsters. She picks the toughest, and a Vicious Grub is placed on the dungeon terrain. A worm like monstrosity rushes forward on multiple tiny legs, and engages Sir Crispin. The Vicious Grub growls hungrily, and belches a foul noxious stench into the air from its open cavernous maw. Sola can do nothing to help and watches in dismay as she sees her beloved friend take on the monstrous creature single handed. Sir Crispin thrusts the sharp point of his mighty sword into the fleshy underbelly of the monster as it rears up to engulf him – more as an act of defence than as a serious attack. But the hero’s weapon connects and the Giant Grub is dealt a hit. The Grub’s fangs glance harmlessly off the brave knight`s thick leather armour. beginning of each move. A note of it is scribbled down on paper. Hillary throws for random spawned monsters, but nothing shows up this move. Moves 12, 13, & 14. The Heroes win the Initiative (every time) for the next few moves and push forward carefully. The Dwarf moves up to (and activates) a teleporter, then carries on towards the main double doors ahead. 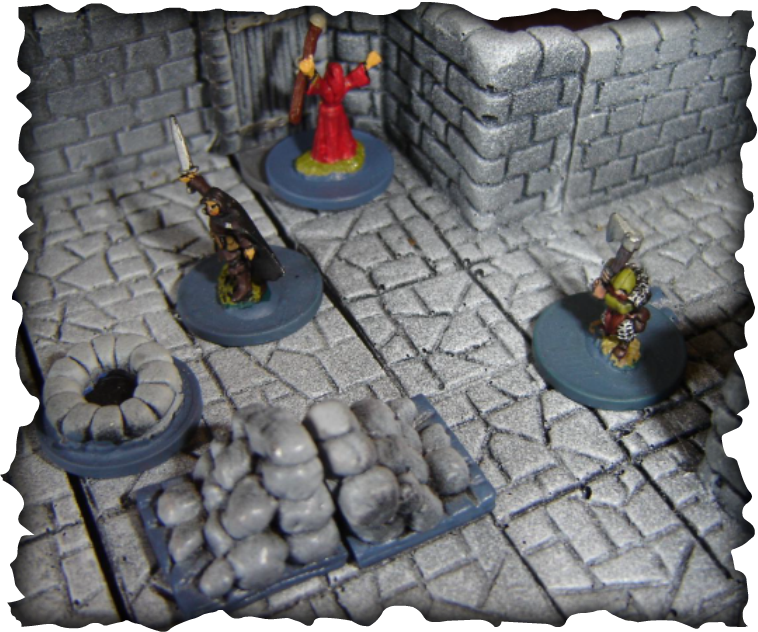 Sola, Sir Crispin and Red join the Dwarf, and take up positions behind her; she prepares to activate listen when the time is right to enter the new dungeon section. Over the last few moves, Sir Crispin has managed to fight off the effects of one Poison Token (which is removed from play), but suffers 1 Poison hit from the second Poison Counter. However, the majority of his wounds are fully healed due to a Health Potion he found lying in a dark corner of the passage. 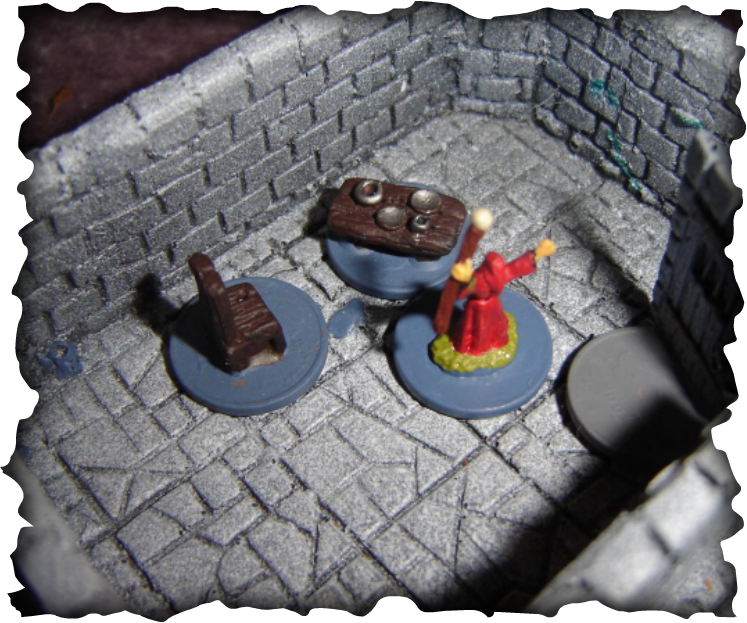 When the team is ready, Sola opens the doors ahead and reveals a new area of the dungeon. The ceiling slopes upwards to the east here, seemingly carved out of the rock with some enormous hammer and chisel. Chunks of stone litter the floor, and heavy footsteps echo from the direction of the north passage. Through the opened door, a whole host of monsters awaits the party, but the glint of gold and other treasure is also apparent. into small splinters of bone. Sir Crispin charges back down the hall in the direction everyone has just come from and engages a recently spawned Orc. He takes its head off with a single clean sweep of his sword. Red moves obliquely into the room (behind the door) and secures a Health Potion he has spotted… handy for using later on. The heroes maintain initiative and continue to cut the enemy apart, a piece at a time. Sola, Red, and the Dwarf move in and slaughter a giant Corpse Crawler (sometimes affectionately known as "Carrot Monsters") at close range, but the beast is amazingly fast, and manages to score 2 hits on Red and 1 on the Dwarf before the heroes plunge the animal back into the abyss. Fortunately, the hits fail to poison the heroes. 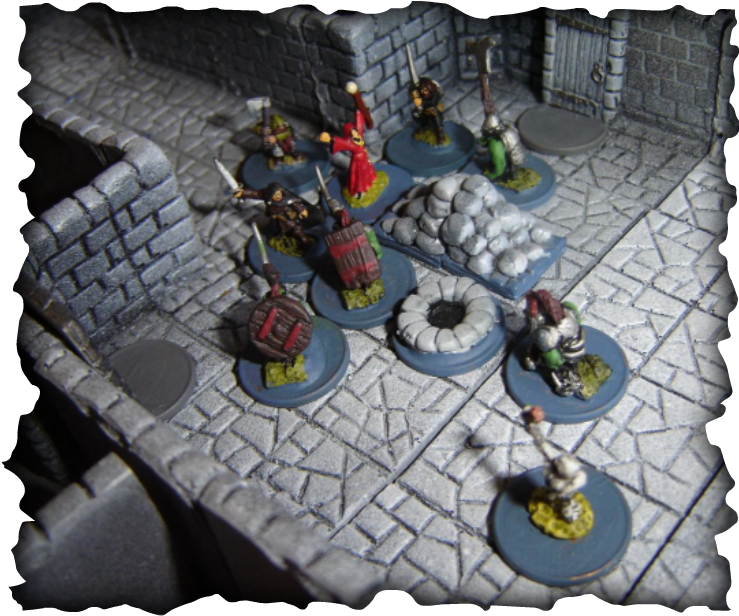 Sir Crispin temporarily takes up the rear, covering the party from surprise attacks… random spawns coming at them from behind is going to be a major problem to the party the further they wander into the complex. Initiative swings back to the Draken Master. Sir Crispin staggers slightly but remains on his feet as he succumbs to another poison wound. That Poison Counter is really taking its toll on this valiant hero. Attack. The digestive bile of these creatures is pretty lethal at close range. Only a few monsters remain alive in this area to face the heroes, and things are suddenly looking pretty good for them; although three of the party have suffered 3 hits each. Red is the luckiest, for he still has an unused Health Potion in his possession. hope in his eyes. Sir Crispin closes the door behind him, and woozily walks towards Red. In melee, the Orc lets out a yelp as he is smitten by the Dwarf`s axe, and falls dead to the floor… cloven neatly in two. Draken Master Hillary smiles wickedly and throws the random spawn dice… but fails to produce even a single monster – aaaagh! But she is still smiling. She has another ace up her sleeve. Suddenly! A large and nasty looking Ogre at the end of the hall thunders forward with an almighty roar, and Charge Attacks Sola and the Dwarf. Both heroes take a hit apiece. But in the melee phase, amazingly the heroes manage to kill the hulking beast in a single round of combat. But in his death throes the Ogre smashed down with his huge mace, and Sola lies in a bleeding mess on the ground… she is slain. But things aren’t looking good for the Draken Master either, and suddenly it seems like the heroes might actually survive this first leg of the adventure. Sir Crispin finally shrugs off the last effects of the toxin (he didn`t need the antidote after all), though that poisonous attack has cost him 3 hits from the powerful toxin… wow, those critters really pack a punch. Red drinks his healing potion, but the bottle must be old and its contents weakened with age, and he only recovers 1 of his 6 wounds (he rolled 1 on the D6 – very unlucky). of the game. Once again the dungeon is temporarily clear of monsters. Suddenly! 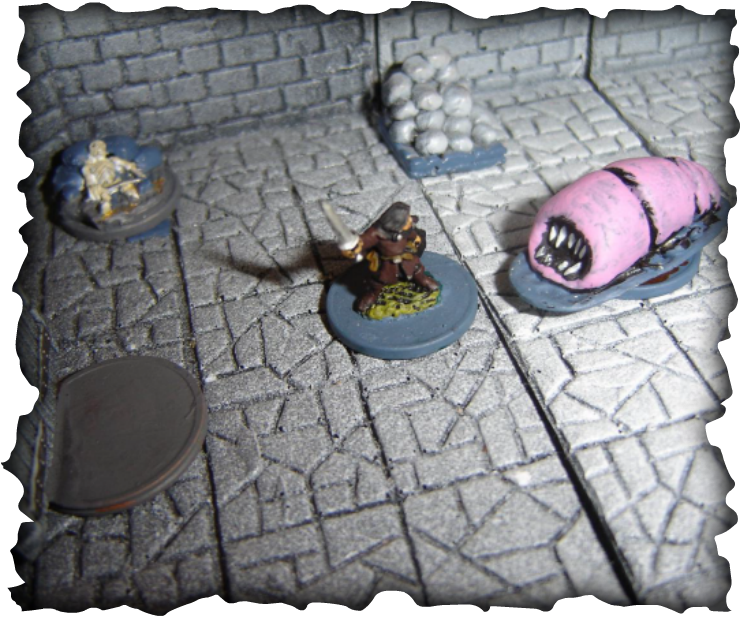 (Move 24) A Grub crawls out of the mud filled well pit behind the heroes, and slithers towards the newly spawned Sola. But the witch holds her ground bravely and smashes her sword into the creature’s body, smiting it dead with an amazing display of combat prowess. The Grub, meanwhile, fails to find a weakness in the Witches defences - and dies unfulfilled. Moves 25, 26 & 27: More abominations spawn from the well pit (now a deep chasm in the ground). Four Orcs move in on Sola, but she casts Multi Shot and fries one creature… then makes a dash for the far door. She sees the Dwarf (who has moved back to aid her) standing vigil in the doorway, ready to aid her friend should she fail to outdistance the monsters. Meanwhile, Sir Crispin and Red push deeper into the dungeon. Red activates a third teleporter as he moves over it. 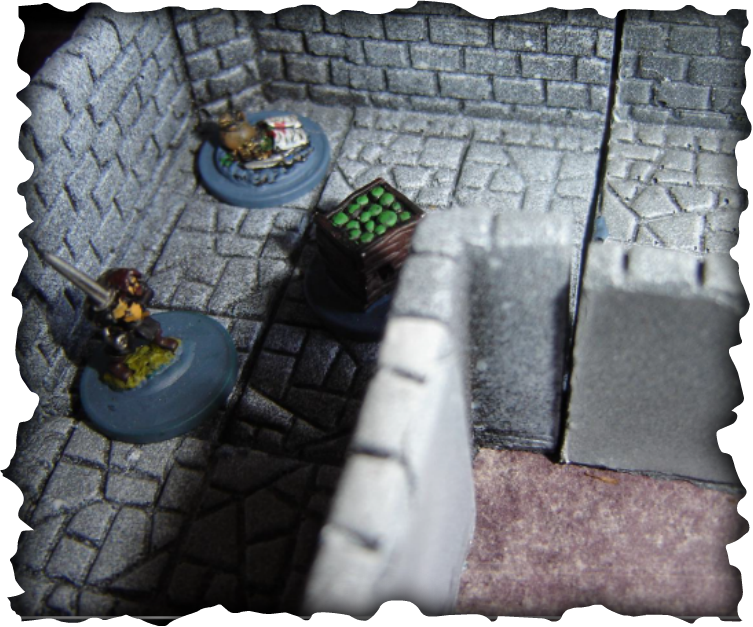 The Orcs catch Sola as she hurries for the safety of the door. One of them rakes at her back, causing 1 hit. In return the heroine slays another of the monsters. Move 28, 29 & 30: The Dwarf moves to join her friend in melee against the Orcs. (which contains a key to an as yet undiscovered door)… and prepares to open a treasure chest at the end of the long corridor. Red picks up a Health Potion, and is desperately hoping his friends win the next Initiative phase so that he can drink the contents of the bottle during the following Mover`s Action Phase. But luck fails the heroes, and a Vampire and a Deadly Pudding spawn and crawl their way towards the girls. Paula (as Draken Master) chooses this moment to spring her main surprise on the heroes… and opens a secret chamber (near the girls) containing a whole formation of skeleton Warriors. *Hillary spawned the Pudding too far away from the heroes to be properly effective. I think she forgot its deadly Underfoot Attack ability, which means the creature could have burst up through the ground… literally spawning at the heroes feet. Move 31: A volley from the skeleton patrol inflicts 2 more hits on Sola, and then the Deadly Pudding squeezes past the skeletons and slides towards the two girls. Move 32: The heroes win Initiative for the move… barely. An AMAZING Multi Shot from Sola kills not only the Pudding, but sends the two skeleton bowmen to their fate as well – wow, nice move! Red drinks the Health Potion and fully recovers all his lost hits. Sir Crispin safely opens the treasure chest without setting off any traps, and finds 100 gold inside. Moves 33 & 34: Another Pudding spawns close by the girls… an Orc also appears from the shadows. Another great Multi Shot sets the Pudding on fire, and it tumbles lifeless back down the hole it sprung from. However, the Orc is unperturbed and charges towards the heroines standing guard at the door - but Sola is on a roll and fries the Orc with yet another well aimed blast from her flaming staff. all the revealed dungeon so far is cleared of monsters and fully explored. Sir Crispin has received 3 hits, Sola now has 4 of her own. Red and the Dwarf have suffered 1 hit apiece … and the Draken Master has already scored 1 victory point. There don’t seem to be any more Health Potions lying around at the moment, and the heroes are reduced quite considerably in health, and without spare Potions, they are in danger of losing more of their number very soon if they are not extremely careful. The Girls are trying desperately to get back to the boys, but are being flooded with an almost nonstop menagerie of monsters which are keeping them holed up by the east door. The boys are eager to press on, but weakened by the absence of the two female warriors, they are fearful of pushing open any more doors and potentially opening up a whole new can of worms. (End of first days play). This game session took place and was written long ago. But I think I will continue it (on my own) sometime soon. I don`t know about you, but I want to know what happens to this intrepid group of adventurers. Will they find the giant and slay him. Will they even survive the dungeon... hmmm maybe one day, we shall see?